Alyssa Donaldson serves clients by building professional and personal relationships, providing strong client service and helping them achieve financial independence. 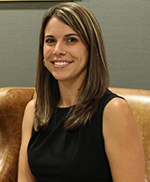 With more than 13 years in the financial services industry, Alyssa's strong understanding of client accounts and retirement plans enables her to provide a seasoned perspective and effective client service. Prior to joining Dogwood Wealth as Director of Client Services, Alyssa served as a Branch Manager Assistant and Client Service Associate at Morgan Stanley. She earned her bachelor's degree in Business Administration from Georgia State University and is Series 7 and 63 registered. Alyssa is an outgoing person who is quick to solve problems, answer questions, provide solutions and proactively communicate important information to clients. She has cultivated a strong understanding of client needs and possesses a breadth and depth of knowledge that result in a first-class experience for clients. Alyssa believes clients appreciate her attention to detail, ability to listen to each client's concern and find a best solution for all. Alyssa and her husband, a teacher and coach at a local high school, are busy raising active children. She relishes the opportunity to volunteer at her children's elementary school. A native of St. Mary's, Georgia, she loves spending time at the ocean and beach with her family. Alyssa is also an avid runner, often competing in 5K and 10K races.